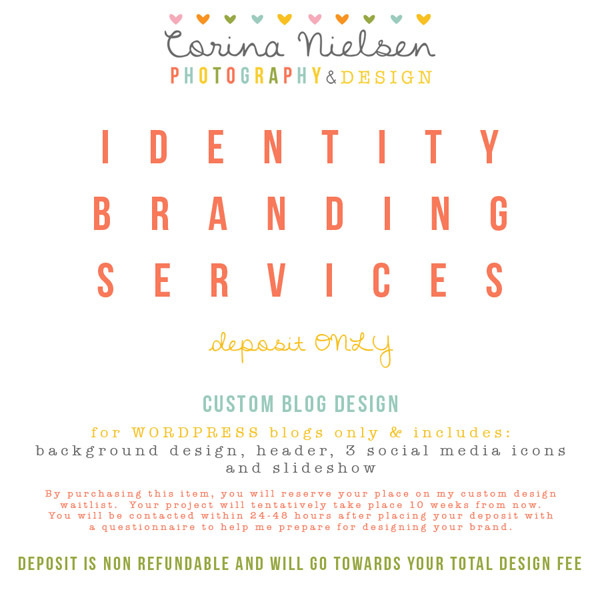 DEPOSIT FOR CUSTOM BLOG DESIGN. START DATE JUNE 2014.
this deposit holds your place on the wait list for custom design services and is non refundable. You will be contacted within 24 hours of a cleared payment to discuss an approximate timeline for your project. Installation prices are separate and also due at the time of delivery of files. Please note that if you are currently hosting through Photobiz or similar sites, they do not allow WordPress blogs. You will need to pay for separate hosting in order to have a custom blog.